For pet parents on the go, the Roller-Carrier takes innovation and fashion to the next level. Whether running errands, traveling or enjoying the great outdoors with your cat or dog, the Gen7Pets Roller-Carrier with Smart-Level™ Platform provides a smart, secure and safe experience for you and your pet. Unlike other wheeled carriers, Gen7Pets’ Smart-Level™ Platform keeps your pet from tipping over as the carrier is pulled from behind. The Pet Life Folding Zippered Collapsible Wire-Framed EASY HOUSE Dog Crate is a lightweight Pet Crate which enables you to carry your pet with ease. It is composed of Dura-Tough Scratch-Resistant Ballistic Nylon. This Dog Crate has Mesh panels on three sides with a Mesh Zippered Entrance in the front. It also has a Velcro Pouch in front where you can conveniently place your belongings. This Dog Crate is great for indoor as well as outdoor use. The Reversible Dog Cushion is composed of Reversible Sherpa and Scratch-Resistant Nylon. Being lightweight and transportable, this Pet Crate Carrier folds to 2 inches narrow making it easy to carry and store when not in use. We carry a variety of colors. The Pet Life 'Ultra-Lock' Wire-Folding Collapsible Dog Car Seat and Multi-Purposeful Convertible Dog Carrier is composed of High-Grade Tough Nylon Fabrics. This Dog Car seat Carrier Features a Zippered Mesh Sunroof along the top so you can comfortably place your pet inside. In addition, there is a Front Nylon Velcro Pouch, a Dual Sided Nylon Pouch and a Mesh Bottle Holder. For added Safety and Support, both sides of this Pet Car seat have Buckles that are meant to connect to any Nylon Car Seat straps that wrap around in a secure manner. Additionally, this Dog Car seat Zips Open from front to back and features a Built-In Leash or Harness Holder to keep your pet safe inside. You can collapse and fold it to 2 inches narrow via the Collapsible PVC inner bars. This Dog Car seat can be carried in the Nylon case provided with it. 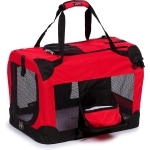 Our 'Pet Life' Airline Approved Folding Zippered CAGE CARRIER zips 360 Degrees. This allows you to collapse the carrier and fold it to about 1 inch thin. It is great for Pet Travelers. The rainbow Pattern looks exceptional on the carrier. You can comfortably carry your pet in it with the Built-in Leash Holder and an optional over the shoulder strap. This Pet Carrier provides your pet some privacy during transportation. Also, the Mesh inner wall in the carrier allows your Pet to breathe comfortably inside. This Pet Carrier also contains 3M Thinsulate thermal heat retention technology inside the removable Sherpa and Scratch-Resistant Nylon cushions. Our Pet Life Folding Zippered SPORTY MESH CARRIER comes with a leash holder and 360 Degree zip which will let you fold it into a thin suitcase. Its sleek design makes it stand out from other carriers. This Airline Approved carrier is perfect for frequent air travelers. Also, this pet carrier is very useful for those who want to carry their pet to a Spa or a Pet Grooming shop. It features a Dual Mesh breathable netting on the side which ensures your pet has a comfortable journey. Along with all these features, your pet has the added benefit of Thinsulate å¬ thermal heat retention technology inside the cushioning of this carrier. We carry a variety of colors and designs. The Pet Life 'Candy-Cane' Fashion Travel Pet Carrier Features Accented Candy-Cane Over-The-Shoulder Straps, making it one pet accessory you donåÕt want to miss. The Mesh alongside the Front of the Dog Carrier will provide ventilation for your pet so that it is comfortable inside the carrier at all times. If your pet is the chirpy kind, the Front Zippered Closures provide it with 'Peek' Room to enjoy the view outside. This Dog Carrier Features Full Mesh and Nylon Adjustable Sun-Roof closures which allow plenty of sunlight to get through. The Built-In Leash Holder included within is an additional safety feature. The Pet Life 'Posh Paw' Pet Carrier features Mesh panels on the side and Mesh Netting at the back which allows breathability and 180 degree view for your pet. This Dog Carrier also features Full Mesh and Nylon Adjustable Sun-Roof closures letting your pet to enjoy the added light. Additionally, it includes a Built-In Leash Holder which will provide your pet with added safety and protection. This Pet Carrier can carry up to 20 Lbs. 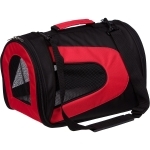 The Pet Life Airline Approved 'Bark Avenue' Cylindrical Pet Carrier is composed of Dura-Tough Heavy Nylon, accented with a High-Impact and Industrial Plastic Protection Frame. It features a 360 Degree Zip Off Entrance on both sides. You can keep additional things in the Front Velcro Pouch attached to the carrier. This carrier comes with Over-The-Shoulder straps that clip on to both edges. 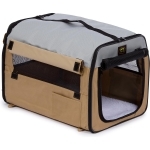 Its Mesh Netting on one of the sides provides your pet with a great Sun-View and added ventilation. The opposite side of the carrier sports 5 accented peak holes for additional air circulation. The built-In Leash Holder included within the Pet Carrier will give your pet added Safety and Protection. Our 'Pet Life' Airline Approved Folding Zippered CAGE CARRIER zips 360 Degrees and collapses and folds to 1 inch thin. It has a beautiful paw print pattern. Also, the carrier is well-suited for all types of Pet Travelers. This Pet Carrier features a Built-in Leash Holder and an optional over the shoulder strap which makes it easy for you to carry your pet. This Pet Carrier provides your pet with a high degree of privacy. Also, the Mesh inner wall will allow your Pet to breathe comfortably. This Pet Carrier also contains 3M Thinsulate å¬ thermal heat retention technology inside the removable Sherpa and Scratch-Resistant Nylon cushions. 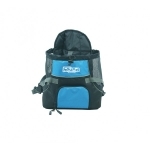 Our Pet Life Folding Zippered Casual Carrier with bottle holder is extremely popular. This Carrier zips all the way around and folds in half which makes it easy to store. It is AIRLINE APPROVED and features a Velcro pouch holder which is great for you to store knick knacks. In addition it has a Bottle Holder next to the pouch. This Pet Carrier comes with an adjustable strap located on the top. This gives you an option to either hold the carrier with the included over the shoulder straps or by the handle. It also includes a washable Sherpa pad that features Thinsulate thermal heat retention technology. The Pet Life Folding Zippered Collapsible Wire-Framed EASY HOUSE Dog Crate is a lightweight Pet Crate composed of Dura-Tough Scratch-Resistant Ballistic Nylon. This Dog Crate sports Mesh Panels on three sides which provides ventilation for your pet. It also has a Front side Mesh Zippered Entrance and a Front Velcro Pouch. This Dog Crate is great for both indoor and outdoor use. The Reversible Dog Cushion is composed of Reversible Sherpa and Scratch-Resistant Nylon. It is lightweight and very handy during transportation. It also folds to 2 inches narrow making it great for storage. The Pet Life Folding Zippered DELUXE VISTA VIEW Collapsible Soft Folding Dog Crate Carrier Features an Included Waterproof Folding Travel Pet Bowl and Incorporated Pop-Out Velcro Dog Tray where the the bottom Velcro of the bowl securely fastens to. Features a Front Zipper for easy In and Out access (Zipper rolls up and Velcros in place). Features a PVC Frame for Added Stability. This Pet Crate mechanically hinges closed and buckles in place. After Folded it can be easily transported around via the Incorporated Side Handle. This Dog Crate Contains Thinsulate å¬ Thermal Heat Retention Technology incorporated within the Scratch-Resistant Nylon/Sherpa Padding. Composed of Ballistic Nylon this Pet Crate is Built-To-Last. Included within the inside of the Pet Carrier is a Built-In Leash Holder for added Safety and Protection. Collapses to 4 inches narrow. The Pet Life Folding Zippered 360 VISTA VIEW Collapsible Soft Folding Dog Crate Carrier is extra stable as it has a PVC Frame. This Pet Crate closes with mechanical hinges and then buckles in place. It is also extremely portable and can be folded down to 4 inches thick. After folding, it can be transported with ease with its convenient side handles. The Scratch-Resistant Nylon/Sherpa Padding inside has Thinsulate å¬ Thermal Heat Retention Technology incorporated within. This pet crate is built to last and is made of Ballistic Nylon. 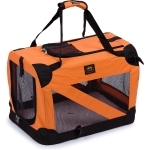 Included inside this Orange Pet Carrier is a Built-In Leash Holder that provides an additional layer of Safety and Protection. With Kyjen's new Legs Out Front Carrier you no longer need to leave your beloved pet at home while you're out. The design makes carrying your pet safe, comfortable and easy, plus your pet will love you for it! Designed to accommodate small dogs, cats and other small animals.